Pancho Barnes was a force of nature, and she didn’t do anything in a predictable way. She was born into wealth, but couldn’t stand the obligations living in high society demanded. Her first marriage was arranged, but subsequent ones were based on passion. Her friends, mostly men, included movie stars, test pilots and anyone who could keep up with her adventuresome spirit. There wasn’t anything she wouldn’t do except for one: conform to what other people expected of her. Barnes’ grandfather, Thaddeus Sobieski Constantine Lowe, was an inventor and pioneer balloonist. He was the first person to take photographs from a balloon and helped the Union Army with reconnaissance during the Civil War. When he moved his family from Pennsylvania to Pasadena, California in 1888 they settled in a 24,000 square foot mansion on Millionaire’s Row. Among other business ventures, he created the Mount Lowe Railway in the local San Gabriel Mountains which ended up costing him his entire fortune, and he died poor. Barnes’ father was Thad Junior, the seventh child of ten. He worked in his father’s businesses, but he preferred to spend his time outdoors and was an excellent horseman. He married Florence Mae Dobbins, a staunch Episcopalian from another moneyed family who also had moved west from Pennsylvania. The bride’s parents gave the couple a house in neighboring San Marino and eight years later upgraded it to a 35 room estate with servants, a pool, tennis courts and stables. Barnes’ older brother, William Emmert, was constantly sick and died when Barnes was 12 years old. While her mother cared for her brother, the rambunctious tomboy was spoiled by her father. Barnes inherited her passions from her grandfather and father, and they treated her like the boy they wanted. When she was three, her father gave her a pony. For her fifth birthday, she got a Thoroughbred, and she won her first equestrian trophy that year. When she was nine, her grandfather took her to the first American aviation exhibition near Long Beach. From her mother, she inherited her name and, unfortunately, her masculine looks. GIRLS JUST WANNA HAVE FUN After a few years of home schooling, Barnes was enrolled in the Pasadena Elementary School, the only girl in a class of 23 boys. She could run faster, spit, curse and fight better than most of her classmates. Her behavior became an issue, but her parents didn’t know what to do about it, so they moved her to a prestigious prep school, Westridge School for Girls. Barnes proved that she just wanted to have fun and didn’t care much about rules, so her parents moved her to a nearby Catholic boarding school, Ramona Convent. During her second year there she ran away on horseback to Tijuana. Now her parents were desperate, but the only option they could think of was to move their daughter away to the Bishop School in La Jolla, an Episcopalian boarding school. Somehow Barnes managed to survive the two years until graduation. After she graduated, Barnes announced that she wanted to be a veterinarian. That was such an appalling idea to her mother that she promptly enrolled the teenager in Stickney School of Art for a more ladylike course of study. This did not offer any real long term prospects, however, so Barnes’ maternal grandmother arranged for her to marry the rector of the local Episcopal church. It seemed like a win-win situation, if not a perfect match. The groom would be appeasing a major contributor to the church and get a new bell tower. The bride would be able to stop living with her parents and have a shot at independence. THAT’S NOT A LADY, IT’S MY WIFE Barnes and Reverend C. Rankin Barnes were married in January 1921. The first time the couple kissed was at the wedding, and the only time they were intimate was on the honeymoon. Nine months later a baby boy, William Emmert Barnes (“Billy”), was born. As was to be expected, Barnes was totally bored being a poor pastor’s wife, but she tried to fill the role for a while. She taught Sunday school and bribed the kids in catechism class with jackknives to entice them to behave. She had no maternal instinct, and nurturing a baby was asking too much of her. Relief came from the burgeoning film industry in Hollywood. Barnes started riding her horses in movies and was so adept she could carry a camera on her shoulder while riding. She was earning at least $100 a day, and as soon as she could she hired a cook, housekeeper and full time nanny. She was so successful Aimee Semple McPherson hired Barnes as her stunt double in shows. When Barnes was 22 years old, her mother died. Her father’s way of coping with the loss was to marry a woman only three years older than his daughter and move to Lake Arrowhead. Barnes coped by running away, traveling across the country by herself for several months. When she returned she took up with a college student and discovered how much fun physical intimacy could be. Their affair lasted several months, and it was followed by another. Barnes’ occasional attempts to act like a pastor’s wife didn’t overshadow her indiscretions, and she became an embarrassment to her upstanding family. She left again, under pressure, on a cruise to South America. A LONG WALK HOME When she returned, she moved into her parents’ house, but she didn’t stay put for long. When some friends got the idea to get hired on as crew on a banana boat bound for South America, Barnes, the only woman, didn’t hesitate to join them. 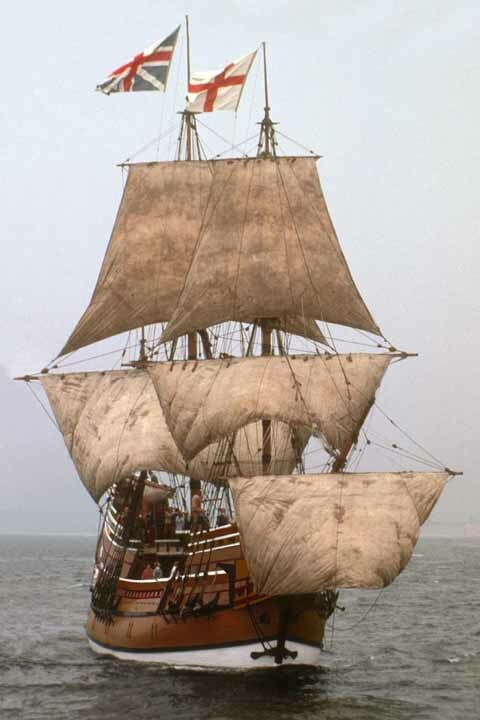 She dressed as a man and signed on as “Jacob Crane.” As soon as the boat left the dock, the adventurers discovered they were running guns and ammunition to revolutionaries in Mexico. When they arrived in San Blas, the ship was boarded by armed guards who used the vehicle to shelter the town’s money from the rebels. The crew was held hostage for six weeks. Barnes and the helmsman, Roger Chute, were the only two courageous enough to escape. The pair stole a horse and burro and set out through the Mexican countryside. Barnes quipped that her partner looked like Don Quixote, and he said that made her “Pancho.” She corrected his reference, saying the character’s name was “Sancho Panza,” but Chute liked “Pancho” better. Barnes liked the sound of Pancho Barnes, and the name stuck. The journey continued on foot, and Barnes and Chute walked over 250 miles from Mexico City to Vera Cruz where they became stowaways on a boat. With help from a connection at the American Embassy, they eventually got on another boat to New Orleans. From there they walked, hoboed and hitchhiked to California. For all of the challenges of the trip, Barnes saw it as a total adventure, and finally she knew who she was and what she was capable of. TAKING FLIGHT It didn’t take Barnes long to need another adventure, and she turned her attention skyward. In spring of 1928 she started taking pilot’s lessons. Her instructor was a World War I pilot, and the airplane had one instrument in it: an oil gauge. A key chain hung from the control board to determine if they were flying straight, and they looked over the side to judge altitude. To know how much gas they had, they dipped a string in the tank and estimated how far they could go. Barnes was immediately hooked, and she bought herself a Travel Air biplane for $5,500. She was more captivated by the thrill of the early days of flying than deterred by the dangers. In 1928 on a trip to San Francisco her engine quit, and she had to make eight emergency landings. The enterprising woman found various ways to earn income as a pilot: test pilot for airplane manufacturers, making promotional flights for Union Oil, and stunt pilot and technical director for the movies. Barnes helped Howard Hughes capture authentic audio of planes for Hell’s Angels by flying past tethered balloons with sound equipment attached to them. 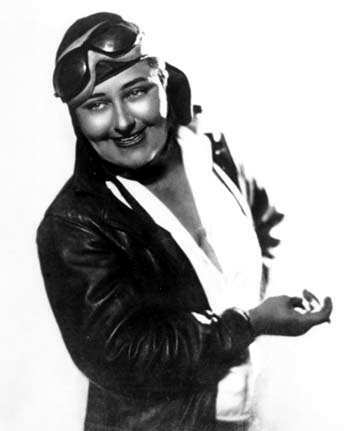 Her interests took a political bent when she founded the Association of Motion Picture Pilots (AMPP) in 1932 so the pilots could get fair wages for their often death defying work. That year she also tried to parlay her popularity into a bid for Supervisor for the Third District in Los Angeles. Even with an endorsement from fellow pilot Amelia Earhart, Barnes wasn’t able to convert her generosity and clout into political office. Barnes worked constantly, but she was better at spending money than saving it. Her home was party central, constantly full of flying and movie industry friends. She had an open door, open bar policy, and she never expected her guests to help foot the bill. In addition to spending lavishly, she used her house and other properties as collateral to buy more real estate investments without any regard as to how she would make payments. STARTING OVER By 1935 Barnes was broke. Conceding that she would never become famous because she didn’t have the requisite good looks or personal backers, she decided it was time to reinvent herself. She rented out the San Marino estate until she was ready to sell it, and she traded an apartment building in Los Angeles for a four-room house and hay barn on an 80-acre alfalfa ranch in the Antelope Valley near Muroc Dry Lake. She moved her horses and airplane to the middle of nowhere. The nearest town was 20 miles away from her Rancho Oro Verde, but there was an encampment for an Army Air Corps squadron to conduct exercises and bombing practice. Barnes was by no means isolated in this desert wasteland. She created an air strip out of the hard earth and built guest quarters so her friends could fly in for a visit. By 1941 she had 360 acres with a farmhouse, stables and swimming pool. She knew nothing about alfalfa farming, so she expanded her venture with dairy cows and pigs. Billy had been living with his dad, but the teenager joined his mom to help out and enjoy new freedom, and Barnes tried to act more like a mother to him. Barnes opened her home and heart to the local fly boys, and even Colonel Clarence Shoop, the commanding officer of the Flight Test Center, used Barnes’ facilities to host parties for visiting dignitaries. In 1939 the Civilian Pilot Training Program was established to train pilots, and Barnes got a government contract to supply planes and instructors for the local school. One of the students distinguished himself from the others. Barnes had had many lovers, but she met Robert Hudson Nichols, Jr. (“Nicky”), about the time her husband asked for a divorce, freeing her and Nicky to get married. The pilot training program lasted two years. The marriage lasted two weeks. After the bombing of Pearl Harbor, the government discontinued the civilian training program and the Muroc Army Air Base became Edwards Air Force Base. With the influx of Air Force test pilots, there were even more guys who joined Barnes’ Hollywood friends to hang out, get a good meal and be entertained. She could match them with flying stories, jokes, drinking, smoking and swearing, and they loved her. Barnes was totally unaware of how much it cost her to host her friends. She often ran out of money to feed the horses or pay bills, and she accrued several liens on her property. But, if all you need is love, Barnes was happy. In 1944 she met Don Shalita, a very handsome show dancer six years her junior. His career was winding down so he moved to the ranch, and a year later they were married. This time Barnes broke a longevity record for actually living with a husband: four months. HAPPY BOTTOM RIDING CLUB Barnes received an inheritance from her uncle, and after World War II she used it to improve her property, calling it Pancho’s Fly-Inn. On 300 acres she opened her own airfield with two runways. Anyone could tie down their plane for free, but they had to buy gas and oil from Barnes. There was a hanger, repair shop and flight school. She added rooms with air conditioning and private baths to her guest house. Barnes built a racetrack, and there was even a fishpond in the shape of the Air Force emblem. She advertised in the Los Angeles newspapers for families to enjoy her “modern flying dude ranch” for $49 a week, per person, meals included. In the late 1940s and 1950s, the likes of General Al Boyd, Commander of Edwards AFB, and Chuck Yeager were regulars at Barnes’ place, but it had become so popular that she felt she was missing the spirit of the old days. She converted the bar and grill into a private club for her Edwards AFB and Hollywood friends and called it the Happy Bottom Riding Club. One of the newer Happy Bottom guests was pilot Eugene McKendry (“Mac”), who ended up at the ranch after returning from a tour of duty overseas. His wife was divorcing him and giving him custody of their son, and Mac needed some encouragement and a place to live. He found both with Barnes, and he was there for her when she needed support. When Barnes was 45 years old, she suffered from hypertension and had a retinal hemorrhage. She ignored the symptoms until she collapsed and a ranch hand called the doctor. Barnes consented to experimental surgery called sympathectomy which destroys nerves in the sympathetic nervous system to increase blood flow. It required two operations with 18-inch incisions on both sides of the spine and partial removal of four ribs. Mac was by her side during her lengthy recovery from the operation and a bout of pneumonia. Life at the Club continued to be one big party, and liquor was flown in illegally from Mexico. Barnes sponsored air shows, rodeos and aerial treasure hunts with other airports. She hired hostesses to wait tables and dance with the men. Barnes denied that she was running a brothel, but the wives of the pilots resented that they spent their free time there, regardless of what they were doing. In addition to the usual carousing, in June 1952 Barnes was involved in planning another bash, her fourth wedding, to Mac. The bride was 51 years old, and the groom was 32. Commander Al Boyd gave the bride away, and Chuck Yeager stood up as her attendant. The 58 second ceremony was presided over by Judge J. G. Sherrill and witnessed by 650 guests. Then the couple exchanged vows again in a Native American ceremony officiated by Chief Lucky and Little Snow White of the Blackfoot tribe. The wedding banquet included four whole roasted pigs, 80 pounds of potato salad, 16 gallons of Jell-O and a 50 pound wedding cake. One of the entertainers at the reception was Lassie. DEALING WITH CHANGE That same year the leadership of Edwards changed, and Brigadier General J. Stanley Holtoner took command. He was all business and didn’t enjoy Barnes’ hospitality as his predecessors had. In addition, the government was buying up all the property adjoining the air base. This seriously jeopardized what took Barnes almost 20 years to build. The FBI investigated Barnes for possible illegal activity, but the worst they could accuse her of was bad credit. There were enough law suits and counter suits to keep both sides busy for a long time, and Barnes always acted as her own attorney. The government finally got legal title to Barnes’ land and gave her $185,000. A few months later, Barnes was driving home from shopping when she saw smoke coming from her property. She lost everything in the house, barn and dance hall to the fire. Conspiracy theories circulating around implicated the government, Barnes and even a drifter who was hanging around. The disastrous fire was the beginning of the end for Barnes. She tried to start over a few miles north in the Mojave Desert and took out mortgages on over 1,000 acres with a little café and gas station. She treated herself to horses, a Stinson airplane and catamaran, but she lived in an abandoned rock building with a dirt floor and broken windows. She had big plans for Gypsy Springs, but she still hadn’t learned to manage her money, and Edwards Air Force Base had grown into a self sufficient community and no longer needed her hospitality. To compound her problems, Barnes had health issues and relationship issues. She was diagnosed with breast cancer and had a double mastectomy. Mac moved to Gypsy Springs and was there for her during the two surgeries, but their relationship was rapidly deteriorating beyond reconciliation. In 1962, Barnes sued her husband for divorce. In her late 60s, Barnes found herself alone. An old friend offered to let her live rent free in a 20 by 25 square foot house. She started breeding Yorkshire terriers, but they just contributed to the increased squalor that she lived in. Her best asset was storytelling, and she was invited to speak at local clubs and banquets, regaling audiences with the spellbinding tales of her life. In the summer of 1971 some of her old friends at Edwards, including Buzz Aldrin, threw a party for her 70th birthday on the base. Barnes could not create a future for herself, and she ended up living off memories and dreams. In the spring of 1975, she never showed up for a speaking engagement and was found dead in her home surrounded by putrid filth. Two friends got permission to fly over the old Rancho Oro Verde and scatter her remains. As the ashes started to drift toward the ground, a crosswind came up and redirected them back into the cockpit of the Cessna. Even in death Barnes still loved a good joy ride. QUESTION: How are you different than what you think other people expect you to be? Kessler, Lauren, The Happy Bottom Riding Club: The Life and Times of Pancho Barnes. New York: Random House, 2000. Tate, Grover Ted, The Lady Who Tamed Pegasus. Maverick Publications, 1984. Schultz, Barbara Hunter, Pancho, The Biography of Florence Lowe Barnes. Lancaster, California: Little Buttes Publishing Co., 1996. JOINING THE FAMILY BUSINESS The Brumbach family were contract players in circuses all over Europe, and Brumbach’s star continued to rise. 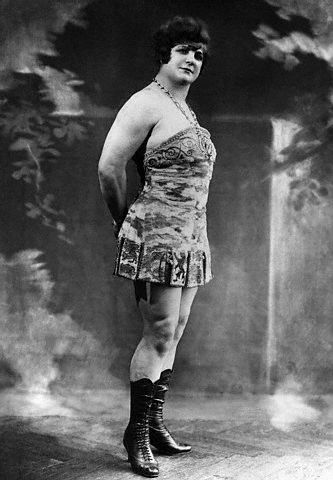 When she was a teenager, her father offered 100 German marks to any man who would come on stage and beat her at wrestling. She won every time, and one evening she got a prize she hadn’t expected. Max Heymann, a five foot six inch acrobat who weighed about 160 pounds, was having a hard time getting his career off the ground. He saw an opportunity for easy cash and sauntered confidently onto the stage. Brumbach won the match handily, but he won her heart. She was 16 and Heymann was 19, and two years later he joined the act permanently when they married. JUST ANOTHER DAY AT THE OFFICE Sandwina and Heymann and a couple of other men became “The Sandwinas.” Early in the 20th century they came to America for a more extended commitment and performed with small vaudeville shows up and down the East coast. A year later they were hired by the prestigious Orpheum Vaudeville Circuit and toured throughout the country. Sandwina was billed as “Europe’s Queen of Strength and Beauty.” She twisted iron bars into spirals and broke chains with her bare hands, juggled cannonballs and supported a 1,200-pound cannon on her shoulders. She even lay on a bed of nails while volunteers used sledgehammers to hit an anvil balanced on her chest. THE PICTURE OF PERFECTION P.T. Barnum was once quoted as saying, “Without promotion something terrible happens…Nothing!”1 so meeting the press became an event. At Madison Square Garden, where they were performing, over a dozen doctors were brought in to weigh and measure Sandwina publicly. She was deemed to be the perfect female specimen. She was five feet nine and three quarters inches tall and weighed 210 pounds. Her chest was 44 inches, her waist was 29 inches, and her hips were 43 inches. Her calf measured 16 inches and her flexed right bicep was 14 inches. To enhance her appearance, especially in contrast to her husband, Sandwina always wore two-inch heels and piled her hair on top of her head to make her look taller. When the measuring was finished Sandwina demonstrated her strength for the reporters. First she lifted Heymann over her head with one hand, and then she lifted her husband and son, holding them both with only one arm. QUESTION: If you could join the circus, what kind of act would you want to do?